Oxford University Press, USA, 9780195368451, 191pp. For over seventy years, there has been one book that law students have read to prepare for what they were about to encounter. That book is The Bramble Bush. After all these years and many imitators, The Bramble Bush remains one of the most popular introductions to the law and its study. Llewellyn introduces students to what the law is, how to read cases, how to prepare for class, and how justice in the real world relates to the law. 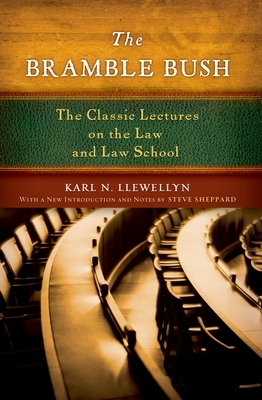 Although laws change every year, disputes between people haven't altered all that much since Llewellyn first penned The Bramble Bush, and the process of moving from private dispute to legal conflict still follows the patterns he described. Moreover, the steps of a legal dispute, from arguments to verdict, to opinion, to review, to appeal, to opinion have changed little in their significance or their substance. Cases are still the best tools for exploring the interaction of the law with individual questions, and the essence of what law students must learn to do has persisted. If anything, many of the points Llewellyn argued in these lectures were on the dawning horizon then but are in their mid-day fullness now. Karl N. Llewellyn was a revered law professor who taught for most of his career at Columbia Law School and the University of Chicago. Renowned as a scholar in many fields, he was a principal author of the Uniform Commercial Code, the nationwide system of commercial law still followed throughout the United States. Steve Sheppard is the William H. Enfield Professor of Law at the University of Arkansas. Among his writings, he is the coauthor, with George Fletcher, of American Law in a Global Context: The Basics, also published by Oxford University Press.